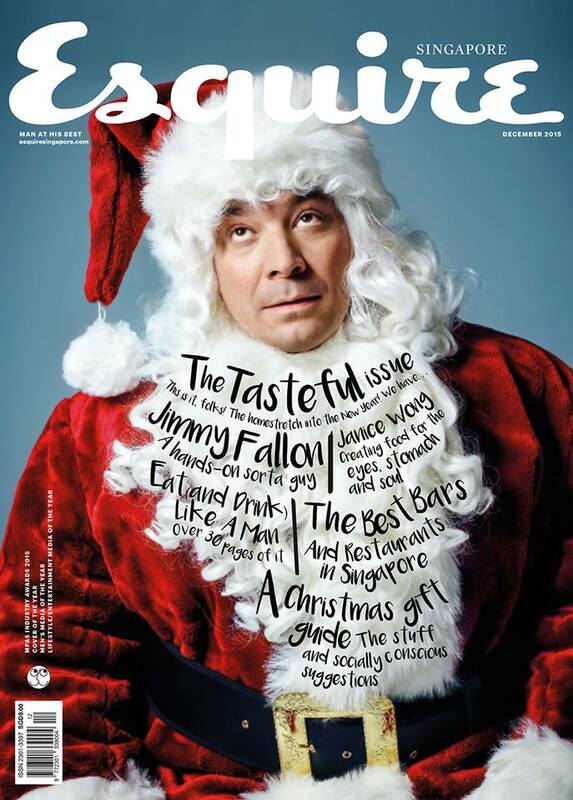 For Esquire's December 2015 Food issue, I've written a piece on the craft of food critiquing and how it has changed with the influx of food bloggers. Has the proliferation of food bloggers and Yelp-type reviewers diminished the "power" of the traditional food critic? 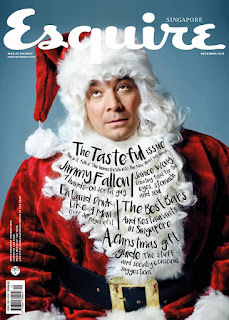 Included in this piece are opinions by my friends Amy Van (food editor, cookbook author, and food stylist, Singapore), André Terrail (La Tour D'Argent, France), Norman Hartono (Tunglok Group, Singapore), Celine Asril (food writer, Singapore), Cheryl Tiu (editor, Philippines), Kenny Leong (wine critic). In my head, I could see the beginnings of a joke set up. "A dining critic for the paper, a French restaurateur, and a food blogger walk into a bar..."
I have to inhale slowly, the air is so thick, it catches in my throat. It's a lazy languid evening. The haze is dense, hovering like low cobwebs along the street lit Mohamed Sultan Road. Pen in mouth, notebook in hand, I'm reflecting on the conversations about restaurant critiquing I've had with close restaurateur and media friends over the week. I can imagine the five of us sitting here on the wicker armchairs, wine or whisky in hand, opining about the value of a food critic. 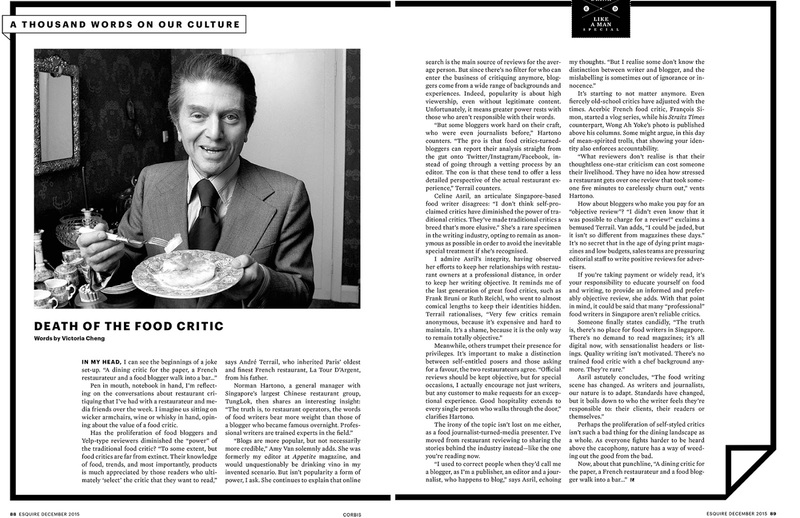 Has the proliferation of food bloggers and Yelp-type reviewers diminished the "power" of the traditional food critic? I would ask everyone earnestly albeit pompously tilting a freshly poured dram. "To some extent, but food critics are far from extinct," his enunciation is French, but not insufferable like the Steve Martin rendition of Pink Panther's exaggerated French; instead, his diction is punctured with crisp European English tones. "The traditional food critic's knowledge of food, trends, and most importantly products is much appreciated by some readers who ultimately 'select' the food critic they will read," continues André Terrail, who in recent years inherited from his father, Paris' oldest and finest French restaurant, La Tour D'Argent. After adjusting his Los Angeles cap in contemplation, Norman Hartono, a general manager in Singapore's largest leading Chinese restaurant group, TungLok, would then part with some interesting insight, "The truth is, to restaurant operators, the words of food writers for publications bear more weight than a blogger who became famous overnight. Professional writers are trained, they are experts in this field." "Blogs are more popular, but not necessarily more credible," Amy Van would solemnly add. She was formerly my editor and mentor at Appetite magazine. She would unquestionably be drinking vino in my invented scenario. But isn't popularity a form of power, I ask. She continues to explain that online search is the main source of reviews for an average person. But since there's no filter for who can enter the business of critiquing anymore, bloggers come from a wide range of backgrounds and experiences. Indeed, popularity is about high viewership, even without legitimate content. It unfortunately means there's greater critique power by those who aren't responsible with their words. "But there are some bloggers who work hard on their craft, some who are or were even journalists before," Norman would say pointedly at myself and Cheryl Tiu, one of the Philippines' most renowned food journalists who has also started a blog in recent times. Similar in age and disposition towards social media, she would be sitting next to me, and probably tweeted a few times together during this conversation. "The pros is that food critics-turned-bloggers can report their analysis straight from the gut onto Twitter/Instagram/Facebook, instead of going through a vetting process by an editor; but the con is that these tend to have less depth, less detailed perspective that correspond to the actual restaurant experience," André counters. Celine Asril, an articulate Singapore-based food writer disagrees, "I don't think self-proclaimed critics have diminished the power of traditional critics, instead I think they've made traditional critics a breed that is more elusive." Celine is a rare specimen in the writing industry herself, opting to remain as anonymous as possible in order to avoid the inevitible special treatment if she is easily recognized. André rationalizes, "Very few remain critics remain anonymous, because it's hard to maintain and it's expensive. It's a shame, because it's the only way to remain totally objective." ...While others trumpet their presence for self-important privileges. There have been well-known cases, such as a former S. Pellegrino Best Restaurant panelist and now chairperson who printed her critic title on heavily distributed business cards (article); and bloggers who demand complimentary meals, or else (article). It's important to make a distinction between self-entitled posers and those who are asking for a favor, the two restaurateurs agree. "Official reviews should be kept objective, but for special occasions, I actually encourage not just writers, but any customer to feel free to make requests for an exceptional experience. Good hospitality extends to every single person who walks through the door," clarifies Norman. I admire Miss Asril's integrity, having observed her efforts over the years to keep her relationships with restaurant owners at a professional distance, in order to keep her writing as objective as an opinion piece can be. It reminds me of the last generation of great food critics such as Frank Bruni or Ruth Reichl, some of whom have gone almost comical lengths to keep their identities hidden. Elusive breed, indeed. The irony of the topic isn't lost on me either, as a food journalist turned media presenter. In light of an increasing public presence, I've moved on from restaurant reviewing to sharing the stories behind the industry instead--like the one you're reading one right now. It sits on my conscience better, and I do find these angles more fascinating. "I used to correct people when they would call me blogger, as I was publisher, editor and journalist, who happens to have a blog," says the petite Chinese-Filipina, nearly echoing my own thoughts, "But you know what today, I realize, some of them don't even really know the distinction between writer/editor/blogger, and the mislabeling is sometimes out of ignorance or innocence." It's starting to not matter anymore. Even some of the fiercely old school critics have adjusted with the times. François Simon, France's acerbic food critic whom some compare to the character of Anton Ego in the 2007 animated film Ratatouille, expanded his media repertoire with a vlog series. The Straits Times food critic, Wong Ah Yoke's photo is published above his columns. Some might argue in this day of mean-spirited keyboard jockeys and trolls, showing your identity also enforces accountability for your words. "What reviewers don't realize is that their thoughtless 1-star criticism that was actually caused from having some personal issues before they arrived, rather than a seriously bad experience caused by the restaurant itself, can cost someone their job, their livelihood--they have no idea how stressed how a restaurant gets over one review that these people took 5 minutes to carelessly churn out." vents Norman. How about the bloggers who make you pay for an appearance and a review--not even being listed as an advertorial-- it is a paid "objective review"? I'd ask while refilling glasses. It is now time to bring up the inevitable name for Asia's best or infamously known food blogger, Brad Lau of Ladyironchef. There's mixed reception to the mere mention of his name. Some maintain that his first big push to popular viewership is the fiasco a few years ago, when he allegedly made a "do-you-know-who-I-am" type statement to a waitstaff who explained that their complimentary meal was for two persons, not four (article by Yahoo, article by Camemberu). "I didn't even know that was possible to charge for a review!" The Paris-based André seems amused that such a transaction exists. He's also drinking wine, a chilled Sancerre, most likely. "Maybe we should all just become food bloggers," Amy laments jokingly at first, before confiding seriously, "I could be jaded, but it isn't so different than magazines these days." She's talking about the unofficial expectation of editorial writers to mention advertisers; in the era of dying print magazines and low budgets, sales teams are pressuring editorial staff to write positive reviews for customers. For those of us who are a little old school about editorial ethics, I can tell you it feels like a part of ourself dies each time we buckled under the pressure. Norman then surprises some of us, frankly stating that he values opinions from certain bloggers such as Ladyironchef, who isn't favored by many of Singapore's restaurant brand managers, "At our restaurant Lokkee, Brad gave a lot of great suggestions with the direction we should go in, and offered ideas for dishes inspired by food he saw in Hong Kong." "We travel to get new ideas and concepts, and his job is to travel and discover new ideas and concepts. When he shares his opinion with us, it's helpful." Amy then elaborates, if you're taking payment or are highly popular, it's a responsibility to educate yourself on food and writing, to provide an informed and preferably objective statement. Considering this point, it could be said that many "professional" food writers in Singapore, even from food publications, are not reliable as critics. We know by now, it is anyone with influence's responsibility to both readers and to the subject to know your craft, to research before reporting. One of our five finally states candidly, "The truth is, there's no place for food writers in Singapore. There's no demand to read magazines, it's all digital now with sensationalist headers or listings. Quality writing isn't motivated. There's no trained food critic with a chef background anymore, they're rare." Celine astutely concludes, "The food writing scene has changed - as writers and journalists, our nature is to adapt. Standards have changed, but it boils down to who the writer feels they're responsible to: their clients, readers, or themselves." Perhaps the proliferation of self-styled critics isn't such a bad thing for the dining landscape as a whole. As everyone fights harder to be heard above the cacophony, nature has a way of weeding out the good from the bad. Now, about that punchline, "A dining critic for the paper, a French restaurateur, and a food blogger walk into a bar..."